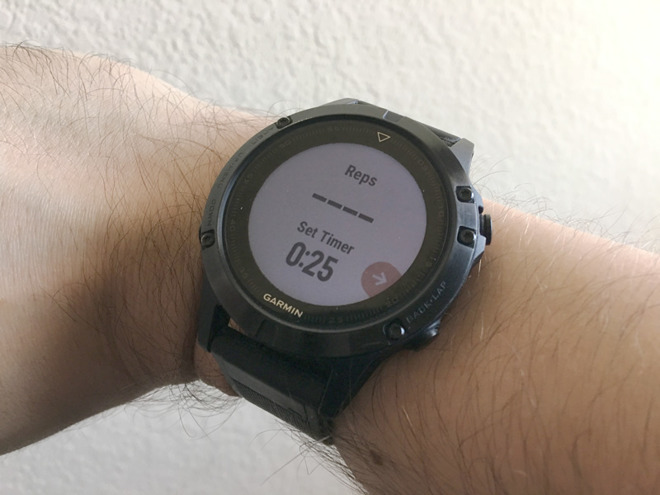 A few weeks ago, Garmin upgraded the "Strength" activity on its Fenix 5 and Forerunner 935 watches with support for counting reps and weights — something Apple would do well to mimic, if just partly, in a future update to the Apple Watch. 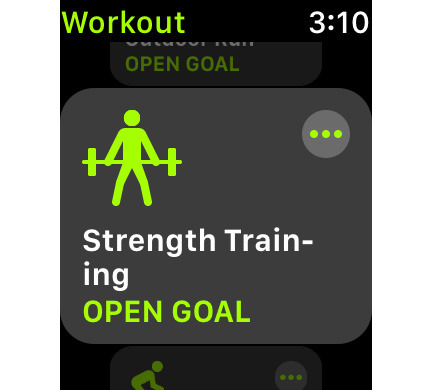 Last month's watchOS 4 upgrade included a "Strength Training" icon and label, but didn't make any fundamental improvements to the barebones tracking we complained about in a recent opinion piece. 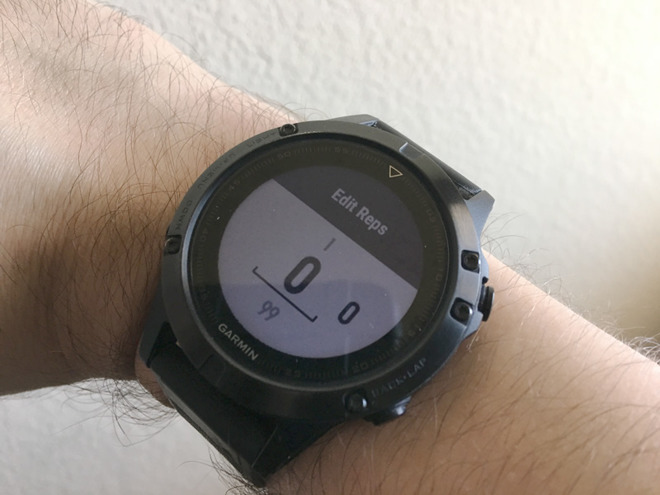 Under the new Garmin system, users start a "Strength" activity as normal, but are immediately greeted by a rep and set time counter. Hitting a particular button starts and stops sets instead of the entire activity, with a rest counter in between. Users can still flip through multiple screens to see information like heart rate zones. Much like the Atlas Wristband, Garmin's technology attempts to detect the exercise you're doing and count the number of reps automatically. 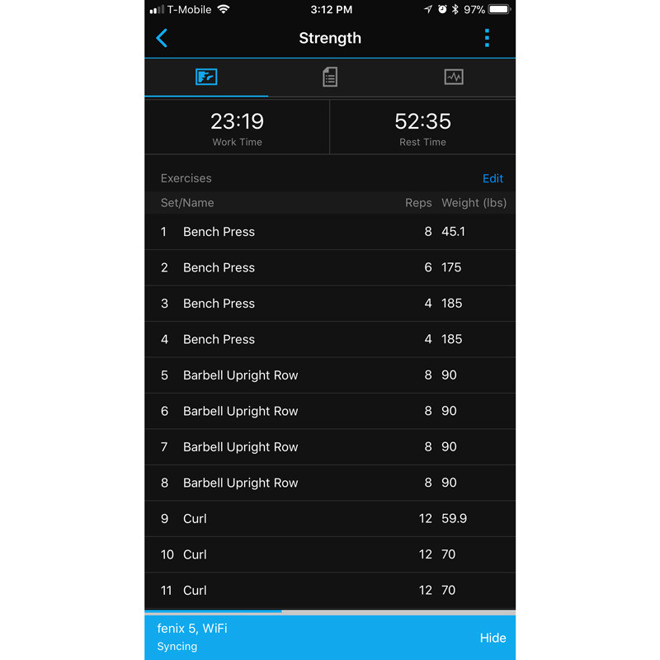 If you want, you can both edit reps and add weight to an exercise, whether on-device immediately after a set, or later on using the Garmin Connect iPhone app. The technology is definitely flawed. It regularly miscounts reps and misidentifies exercises — not everything is a bench press or lateral raise, Garmin — which means you'll be doing a lot of editing post-workout if you want to maintain accuracy. There also seems to be no long-term trend analysis that isn't cardio-focused, and for obvious reasons there are some exercises it just won't track automatically, like a leg press. Still, simply counting sets and rest times would be an improvement in watchOS, and not terribly difficult to implement. The linear start/stop flow of Garmin's on-device interface makes things simple to process, too. Apple might want to hold off on automatic rep tracking, but it's not inconceivable that the Activity app for the iPhone could be upgraded with options for manually adding names, reps, and weights — or, in an ideal scenario, graphs for trends and individual workouts. Any of this would be useful for weightlifters, since it's easy to lose track of progress without writing stats down.